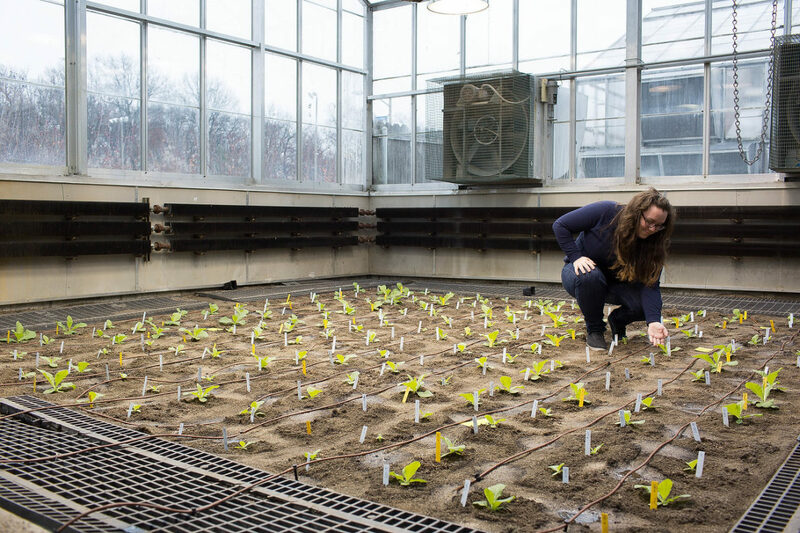 Scientist Amanda Cavanagh tests tobacco plants engineered with alternate photorespiratory pathways in a specialized greenhouse to select optimal genetic designs that can be used to boost the yield of key food crops. 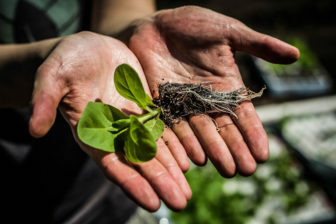 URBANA (January 3, 2019) – Plants convert sunlight into energy through photosynthesis; however most crops on the planet are plagued by a photosynthetic glitch, and to deal with it, evolved an energy-expensive process called photorespiration that drastically suppresses their yield potential. Today, researchers from the University of Illinois and U.S. Department of Agriculture Agricultural Research Service report in the journal Science that crops engineered with a photorespiratory shortcut are 40 percent more productive in real-world agronomic conditions. 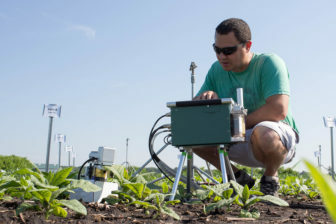 Scientists plant tobacco seedlings by hand to test alternate photorespiratory pathways in real-world field conditions. They found that these synthetic shortcuts boost productivity by 40 percent, and will now apply this breakthrough to boost the yield of food crops. 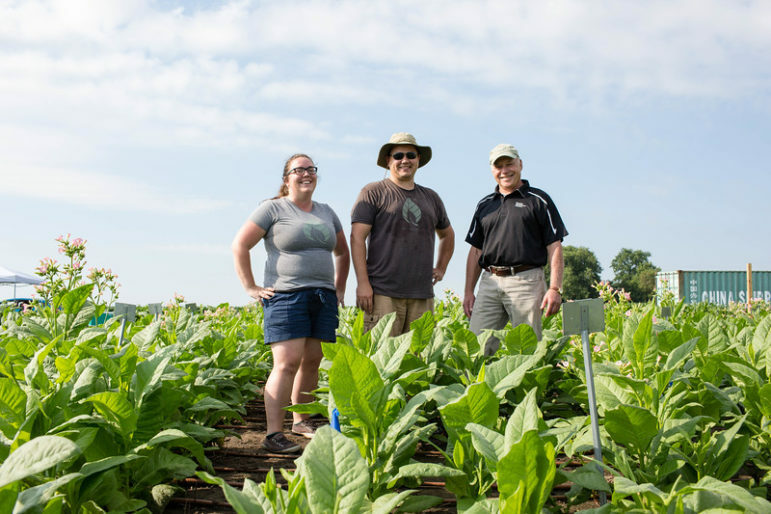 Over two years of field trials, scientists Donald Ort (right), Paul South (center) and Amanda Cavanagh (left) found tobacco plants engineered to shortcut photorespiration are about 40 percent more productive in real-world field conditions. Now they are translating this technology hoping to boost the yield of key food crops, including soybeans, rice, cowpeas, and cassava. Photosynthesis uses the enzyme Rubisco—the planet’s most abundant protein—and sunlight energy to turn carbon dioxide and water into sugars that fuel plant growth and yield. Over millennia, Rubisco has become a victim of its own success, creating an oxygen-rich atmosphere. Unable to reliably distinguish between the two molecules, Rubisco grabs oxygen instead of carbon dioxide about 20 percent of the time, resulting in a plant-toxic compound that must be recycled through the process of photorespiration. Scientist Paul South measures how well tobacco plants modified to shortcut native photorespiration photosynthesize compared to unmodified plants. Now, these genetic changes that boost productivity by about 40 percent are being translated to boost the yield of key food crops. “Much like the Panama Canal was a feat of engineering that increased the efficiency of trade, these photorespiratory shortcuts are a feat of plant engineering that prove a unique means to greatly increase the efficiency of photosynthesis,” said RIPE Director Stephen Long, the Ikenberry Endowed University Chair of Crop Sciences and Plant Biology at Illinois. 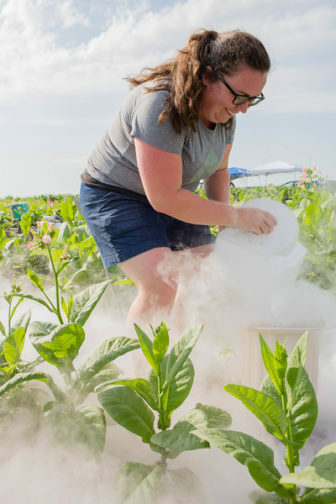 Scientist Amanda Cavanagh snap freezes plant samples with liquid nitrogen to study how the metabolism differs between unmodified plants and plants engineered with alternate pathways for photorespiration. 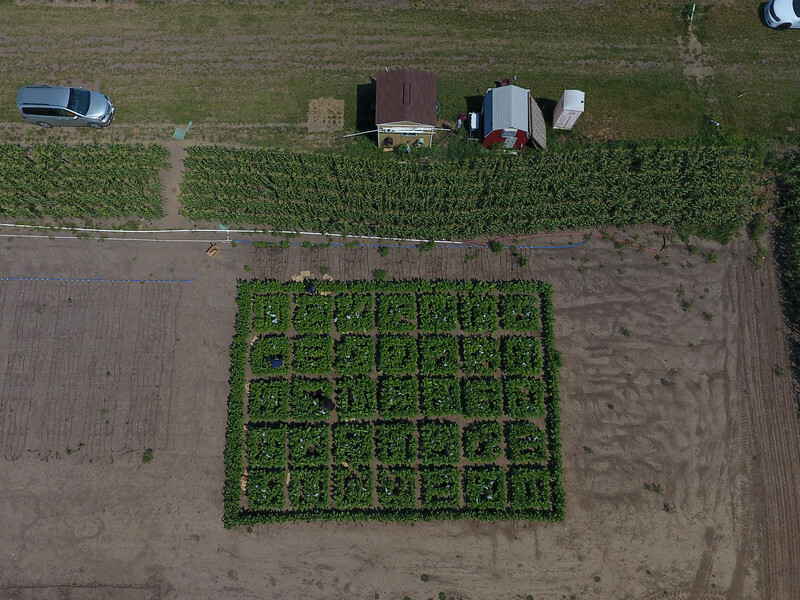 Aerial view of the 2017 field trials where scientists studied how well their plants modified to shortcut photorespiration performed beside unmodified plants in real-world conditions. They found that plants engineered with a synthetic shortcut are about 40 percent more productive. Realizing Increased Photosynthetic Efficiency (RIPE) is engineering staple food crops to more efficiently turn the sun’s energy into yield to sustainably increase worldwide food productivity, with support from the Bill & Melinda Gates Foundation, the Foundation for Food and Agriculture Research (FFAR), and the U.K. Government’s Department for International Development (DFID).